The memories of that day are still fairly recent. 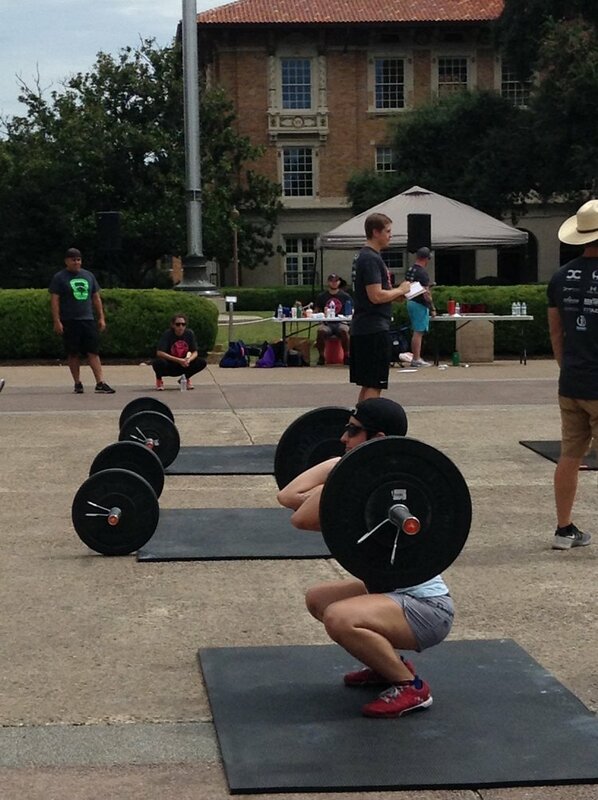 I competed in the scaled division of the 2016 Burpees for Boobies competition on October 1st, with four other members of my box. It was a great day for a competition. The weather had just started to cool off and that morning was particularly nice: a slight chill with beautiful sunlight. I even wore sweatpants. Of course, me being me, that all fell away and was replaced by stress as soon as I arrived at the event. The competition was to be held in the Main Hall at the University of Texas in Austin. Well, my GPS was not smart enough to take me directly to the Hall, so I had to park and find my own way. Being directionally challenged, I knew as soon as I got out of my car that I would be getting lost. I decided to just jump from one map of campus to the next, hoping to find the elusive Hall at some point. Luckily, my brother had tagged along and helped me read the maps, keeping me from going left when I should have been going right and vice versa. Needless to say, when we finally found the place I was a little agitated. But I checked in, made a run to the bathroom, and tried to calm myself down a bit. My friends had already arrived, as had a few others who had come to support us, and they had staked out a spot near the competition floor. So I sat with them for an hour and a half, talking and laughing until game time. I was in Heat 5, so I had ample time to observe the other athletes and strategize before it was my turn to take the floor. Which didn't help prepare me at all. The first workout was a chipper, consisting of wall balls, a sandbag run, kettle bell swings, another run, burpees, one final run, and knee raises. The run, which I had formerly considered a strength, is what hurt me in the end. That sandbag felt a lot heavier than the thirty pounds it was. All I could do was try to keep breathing and moving to finish within the fifteen minute time cap. I finished in time, shaking from exhaustion and a rush of adrenaline. I signed the card handed to me by my judge (who, in my delirious state, I do remember being very cute) and made my way to the sidelines, wishing my friends good luck and then watching them suffer through the same thing. I cheered them on as loud as I could manage, knowing the pain they were in. I had a few hours until the next workout: a clean ladder. I was the most excited for this event. Barbells are my favorite, and cleans are my most favorite. I'd been looking forward to this event for weeks, and when they gathered us up to start the lifts, I walked myself to the front of the line. The weights started at 85 pounds and increased by 10 pounds, ending at 165 pounds. We had 30 seconds to lift each bar twice, using our remaining time for over the bar burpees if we happened to miss a lift. I knew I could at least make it to the 135 pound bar, and was hoping to lift 145 for a PR. The announcer instructed me to take my place at the first bar. I did, and began to pull it to me. "DON'T lift the bar yet." I looked over at the announcer. Fine. I'll just wait here then. Once he finally gave me permission to lift, I got into a groove. I was doing well, on my way to a PR. My first clean at 135 didn't feel too bad, so I went for the second. Fail. I pulled, dropped underneath, and got it to my shoulders. But it fell to the ground before I could even stand from my squat. My legs were tired from all the running. So I dropped to the ground and cranked out as many burpees as I could. Even though the PR didn't happen, it still ended up being my favorite event of the day. The last event was when things got real, emotionally. It was a ten minute AMRAP of cleans, over the box jumps, front squats, over the box jumps, and jumping pull ups. My legs were on fire the entire time. I eventually ended up having to step onto and then over the box because I didn't trust my legs to catch me if I were to jump. I was in pain, the lactic acid was building up, and I found myself wanting to break up my reps. But every time I stopped moving, before I even thought about it, my friends would scream. All of them. They would yell at me until I picked the bar up again or stepped back onto the box. They kept me moving, and each time I heard their voices my heart would swell. I'm not the kind of person who cries very often, but if I hadn't been occupied with trying not to die, I probably would have shed a tear or two. I wanted to keep going for them. I had never completed a workout for someone else before. It had always been for me, which isn't a bad thing. But I wanted so bad for them to be proud of me. My best finish of the day was during that workout. Those crazy people pushed me to a second place finish. Out of the entire event, I placed 5th in my division. Not bad for my first competition. It was a good experience, and I learned a lot about competing that day. But I think I learned more about the kind of people my gym buddies are. They are the sweetest group of badasses I've ever met. They were cheering on me, the loner, the one that always came to the gym grumpy and didn't want to make eye contact with anyone. A year later they're cheering me on as if they're my own family. Yes, I learned valuable lessons about competing that I will take with me to future events. But I'm going to carry that feeling of pride and honor I felt during that last workout with me as well. No matter if my friends are on the sidelines or not, I'm going to replay their cheers in my head forever. That's what will get me to the Games one day.